Take a look at our Reviews to see what our customers have said about our services. See how we can help you with boiler installations and repairs; central heating updates, maintenance and repairs, or kitchen and bathroom fitting. Splash Plumbing Ltd. provides a complete boiler service, including boiler installations, boiler breakdown repairs and boiler servicing. We work within a 30-mile radius of Bexhill in East Sussex. We also offer central heating updates, repairs and maintenance, and powerflushing. Further services include kitchen fitting and bathroom fitting. No job is too large or too small - just ask us for a FREE QUOTE. Splash Plumbing Ltd. is a family run business and have been trading for over 10 years. 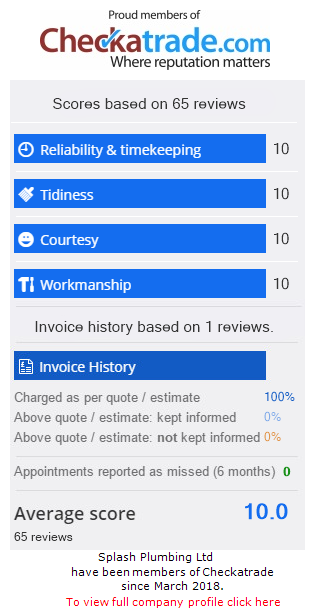 Our business has grown from strength to strength, with many loyal customers and we're proud to say that we have an outstanding reputation. We have recently moved our plumbing and heating services to East Sussex. Our head office is now located in Bexhill-on-Sea, and we offer our plumbing, heating and boiler services across Eastbourne, Hastings, Bexhill, Pevensey, Hailsham and surrounding local areas. As registered Worcester Bosch installers all our boiler installations are covered with a 5-7 year guarantee, which gives you complete peace of mind. If you want to know more about our plumbing and heating services, or our competitive prices, please contact us today. All our Worcestershire Bosch boilers include a 5-7 year guarantee.